Make your child's next birthday one to remember! Birthdays come but once a year. Since it is my birthday week (yeah, I claim a whole week) I wanted to feature some awesome children birthday party ideas. Nothing is more memorable growing up than your birthday and the people you spent them with. So here are a few ideas to incorporate when throwing the next birthday bash for your little ones! Kids and parents alike love balloons. Lots and lots of balloons. Why not make your guests feel amazing the moment they walk up the driveway? Plus… A great way to stay off the cellphone giving directions. 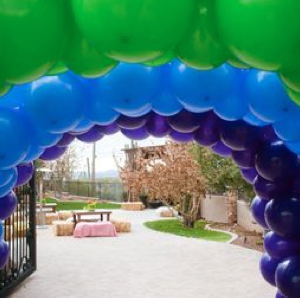 No one can miss a good balloon arch. A simple solution to the question "How are we going to keep that many kids entertained?" A simple solution that lets the kids have fun and the parents hang back and be able to enjoy the party too. Something as simple as a few games out on the lawn can keep the kids entertained for hours! Try an outdoor carnival with prizes to step the day up to the next level! Throwing a party for a child is a great excuse to go with a bright and bold color scheme not fit for the causal everyday backyard barbeque. Go crazy with your child’s favorite color and make it the highlight of the party! Simple color coordination such as the plates, silverware, cups, and tablecloths matching make a big difference between a normal party and a well thought out party that friends and family can remember for a long time. The best party favor because everyone gets to choose what they take home! It is really simple and easy to set up. Also a great way to add more color to the party, which means less decorations! Try custom bags or even custom candy with the birthday boy or girls name on them for an even more memorable touch!